We provide detailed descriptions of our refined protocols for the cell-free production of labeled protein samples for NMR spectroscopy. These methods are efficient and overcome two critical problems associated with the use of conventional Escherichia coli extract systems. Endogenous amino acids normally present in E. coli S30 extracts dilute the added labeled amino acids and degrade the quality of NMR spectra of the target protein. This problem was solved by altering the protocol used in preparing the S30 extract so as to minimize the content of endogenous amino acids. The second problem encountered in conventional E. coli cell-free protein production is non-uniformity in the N-terminus of the target protein, which can complicate the NMR spectra. This problem was solved by adding a DNA sequence to the construct that codes for a cleavable N-terminal peptide tag. Addition of the tag serves to increase the yield of the protein as well as to ensure a homogeneous protein product following tag cleavage. 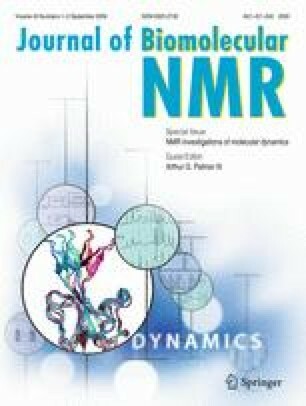 We illustrate the method by describing its stepwise application to the production of calmodulin samples with different stable isotope labeling patterns for NMR analysis.